In April of 1961, roughly 1,500 American-trained Cuban exiles invaded their homeland in an attempt to overthrow Fidel Castro’s government. That assault, now referred to as the Bay of Pigs Invasion, ended up in failure, as the Cuban militia proved too powerful, capturing 80% of the invaders while killing most of the other 20%. The political fallout in the United States was massive, and the desire of the typical American to further engage Cuba in battle was understandably low. Further, other nations questioned America’s desire to attack a neighboring sovereign, especially one who had shown little in the way of aggression to the U.S. and was already the subject of American economic sanctions. But the Cold War was in full force. The U.S. saw Cuba as subordinate to the Soviet Union and having a Soviet stronghold just 90 miles off Florida troubled the leadership of the American military. 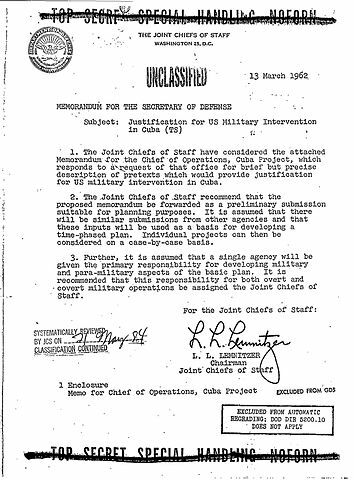 The Department of Defense (DoD) and the military’s Joint Chiefs of Staff (JCS) felt the need to revive civilian interest in overthrowing Castro and liberating Cuba. Absent a Cuban strike on Americans, though, this seemed unlikely. And no such Cuban strike was likely imminent. So the DoD and JCS proposed to create such an attack themselves. A fake one, aimed at turning public opinion against Castro and in favor of continued military action against Cuba. Blowing up a U.S. ship (again, unoccupied) somewhere near or within Cuban waters, blaming the assault on Cuba’s air force or naval batteries. Painting U.S. fighter jets to look like Soviet MIGs and then harassing civilian flights with these planes — potentially looping in the commercial pilots to help convince passengers of the ruse. Potentially shooting down an aircraft traveling from the U.S. to Central America, purportedly transporting college students (but actually empty), as it passed over Cuban air space. In almost all cases, the plan was designed to avoid killing American civilians, although the same could not be said for “boatload[s] of Cubans” destined for Miami. Regardless, the total death toll from Operations Northwoods was zero. Then-President John F. Kennedy rejected the idea and removed its lead proponent, General Lyman Lemnitzer, from his position as the Chairman of the Joint Chiefs of Staff. From the Archives: Invading Canada: The story behind the U.S.’s now-retired plan to invade Canada, if need be. Related: You still can’t buy Cuban cigars. But you can smell like them.